OAKLAND — A grand jury on Wednesday indicted Yusuf Bey IV, the scion of the defunct Your Black Muslim Bakery, on three counts of murder for ordering the killings of journalist Chauncey Bailey and two other men in 2007, an Alameda County deputy district attorney announced. The indictment of Bey IV, 23, includes charges with special circumstances — allowing prosecutors to seek the death penalty against him. He allegedly told two of his followers that in exchange for killing Bailey, he would teach them how to file fraudulent loan applications that could reap hundreds of thousands of dollars. Audio-Slideshow: Michael J. Wills Jr.
Another man, Antoine Mackey, 23, was indicted on three counts of murder with special circumstances, including Bailey’s killing. The grand jury also indicted Devaughndre Broussard, 21, in the killings Bailey and another man, Odell Roberson. His charges also carry special circumstances. But Broussard, until Wednesday the only person charged in Bailey’s death, cut a deal with prosecutors in which he is expected to plead guilty to two counts of voluntary manslaughter in exchange for key testimony against Bey IV and Mackey. In a statement to prosecutors last month, Broussard said Bey IV ordered him and Mackey to follow Bailey, learn his routine and then “take him out” before he could publish an article in the Oakland Post about the bakery’s troubled finances. Broussard said Bey IV promised the two help in securing loans worth hundreds of thousands of dollars through fraudulent applications. Wednesday’s indictments came just hours after a judge for the second time ordered Bey IV to stand trial in an unrelated kidnapping and torture case from 2007 for which he faces a life sentence if convicted. The attorney representing him in that case, Anne Beles, declined to comment on the indictment. Broussard will receive a sentence of about 25 years in exchange for his admissions and testimony, his attorney, LaRue Grim, has said. Grim said his client is prepared to plead guilty next week. -For ordering the killing of journalist Chauncey Bailey. -For ordering the revenge killing of Odell Roberson. -For ordering the killing of Michael Wills. -For killing Bailey at Bey IV’s command. -For killing Roberson on Bey IV’s command. -For helping Broussard stalk Bailey and drive the getaway vehicle. -For helping Broussard lure Roberson to a dark spot and handing Broussard the weapon used in the killing. -For killing Wills on Bey IV’s order. Prosecutor Christopher Lamiero announced the grand jury’s action about 2 p.m. He declined to elaborate on the charges. Lamiero has led a wide-ranging and aggressive investigation of Bey IV for more than six months. 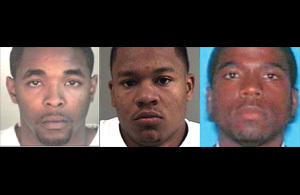 –Bey IV, on three counts of murder for allegedly ordering Broussard and Mackey to kill Bailey before he could publish a story in the Oakland Post about financial problems at the bakery; for telling the same pair to kill Odell Roberson for retribution because Roberson’s nephew killed Bey IV’s brother; and telling Mackey to kill Michael Wills, a white man, because, according to Broussard’s statement to prosecutors, he was “a devil.” Bey IV was also indicted on a charge of ordering the shooting of a car Dec. 7, 2006. A women at the bakery had been in a dispute with its owner, the father of her child. –Mackey, on three counts of murder for allegedly accompanying Broussard to the Bailey killing and serving as his driver; for helping Broussard lure Roberson to a dark corner and providing the assault rifle Broussard used to kill him; and for shooting Wills at Bey IV’s order. Broussard said Mackey later bragged to him about killing Wills, likening himself to the cartoon character Elmer Fudd who was often portrayed hunting Bugs Bunny. –Broussard, on two counts in the killings of Bailey and Roberson. Bailey’s sister, Lorelei Waqia, said she grudgingly approves of the plea agreement with Broussard because it strengthens the chances of convicting Bey IV and Mackey in her brother’s slaying. Bey IV “and Mackey are more dangerous than Broussard. In the perfect world, he (Broussard) would get life but that’s how a plea bargain is: You have to give a little to get a lot. It’s worth it to get the other guys,” Waqia said. Still, Waqia said, the charges will bring little solace. “Anything that happened from the day he passed until now is not going to bring him back. So, for me, there’ll never be closure because I’ve lost a brother; my father has lost his namesake; his son, my nephew, has lost a father who was a mentor to him,” she said. Bey IV and Mackey are scheduled for arrangement next week. Bey IV is in Alameda County’s Santa Rita Jail on unrelated charges, but Mackey is in San Quentin State Prison on a burglary sentence. The indictments of Bey IV and Mackey come after a lengthy re-investigation of Bailey’s killing by the Alameda County District Attorney’s Office. The Oakland police homicide investigator first assigned to the Bailey case, Sgt. Derwin Longmire, is suspended and the department is moving to fire him after he was found to have compromised the investigation and had undocumented contact with Bey IV against orders. Longmire was friendly with Bey IV and used him to solicit Broussard’s original confession a day after the killing. The Chauncey Bailey Project reported last year that Longmire didn’t document evidence in his case notes that pointed to Bey IV’s alleged involvement in a conspiracy to kill Bailey. That evidence included a report from a tracking device that showed Bey IV’s car parked outside Bailey’s apartment fewer than seven hours before the Aug. 2, 2007, killing and a secret jailhouse video, recorded as part of a separate case, on which Bey IV mocked and laughed about Bailey’s death, said he put the shotgun used in the attack in his bedroom closet afterward, said he played “hella dumb” when questioned, and bragged that Longmire was protecting him from charges. The charges against Bey IV mark the first time in the nearly 40-year history of the former bakery started by his father, Yusuf Bey, that a person associated with it, other than Broussard, faces murder accusations. Authorities, though, have long investigated the organization on suspicion that members killed for retribution and power, dating back decades to a forerunner of the organization in Southern California. Members are suspected in the unsolved slayings of at least five others — husband and wife Wendell and Birdie Mae Scott in 1968; Ronald Alan in 1982; Peter Kaufman in 1986; and Waajid Bey in 2004. Grim, Broussard’s lawyer, has said his client is “a human being seeking redemption” who regrets his actions. The crime for which he is to plead guilty, voluntary manslaughter, seems not to fit the coldblooded nature of the killings to which he has admitted. California law defines voluntary manslaughter as “the unlawful killing of a human being … upon a sudden quarrel or heat of passion.” Broussard said he shot Roberson with an assault rifle as the man stood before him with his hands in the air. An autopsy showed Roberson was hit with about 14 bullets that caused “extensive destruction” to his head, left arm and torso. According to Broussard’s statement to prosecutors that is the basis of the plea, he and Mackey hunted for Bailey and Broussard shot him three times at point-blank range with a load of buckshot. The third shot, which eviscerated much of Bailey’s face, was fired as the victim lay on the ground dying. What about charging all 3 with a hate crime? Killing Michael Wills, my friend, because he is white is a hate crime. Period. Hate crimes can happen to white people, and do. This is a text book example of a hate crime. Charging these criminals with a hate crime would increase their sentences and maybe keep them locked up forever, which would be the next best thing to the death penalty. Craig – I couldn’t agree more. To have the papers state that Michael was killed because he was white, and have no mention of that in the charges at all is freakin ludicrous!! I’ve said it before, and I’ll say it again…….If I killed a black man because he was black, there would be riots, poeple protesting, it would have been a huge topic in all the major news outlets, and it could very well have sparked some retaliation. So why are we dealing with a double standard here? If Michael was killed because he was white, it needs to be charged as a hate crime. I’m not saying that becuase it means the sentence could include the death penalty, I’m speaking from a strictly “let’s all be treated equal” standpoint. What’s good for the goose is good for the gander.